Sunday: Drive to Memphis for work. Monday: Work in Memphis all day. Tuesday: Work in Memphis part of day. Drive back to Little Rock. Wednesday: Cram a month's worth of trial prep into a single day because I was told late in the game (i.e., last Friday!) that I would be solely responsible for my very first trial. Thursday: Wake up at 5 a.m. and drive three hours to try my first case; drive back to Little Rock. Friday: Possibly drive three hours to finish trying my first case. Driving home from work last Friday, I nearly hyperventilated. I had no clue how I was going to manage it all. Not to mention I've been feeling a bit run down lately and have been on a steady stream of over-the-counter medications. I woke up last Saturday and had a quiet moment to myself. I thought, "Please God. Make this next week easier. Please. I have no clue how I'll make it work." A few hours later, I got a call from a partner at my law firm. He was supposed to travel to Memphis with me. He called to say that our trip to may be delayed due to bad weather. He promised to call back on Sunday by noon with a definite answer. On Sunday, around 11:30 a.m., I got the call that the trip to Memphis had been delayed. We didn't know when it would happen now, but we knew it wasn't on Sunday or Monday. I took a small sigh of relief and figured I could go into the office on Monday and get a leg up on trial prep. On Tuesday I woke up to find that I was STILL iced in. In fact, if anything, the hill we lived on was much more slick than the day before. It was solid ice. I started to panic. I needed to prepare for this trial. I was going to look like an idiot in front of the judge... our client... and opposing counsel! This could not be happening. I panicked. And yet, within a few hours, a series of pleadings were filed by opposing counsel and -- without boring you with all the lawyer details of why it happened -- the trial essentially became unnecessary! I took a HUGE sigh of relief and tried to enjoy a second day iced in with Adam. On Wednesday, I finally managed to make it into the office. With my trial cancelled, my desk was actually pretty clear. I did learn that the Memphis trip was rescheduled for the following day, but that it would only be a day trip now. On Thursday, I headed to Memphis with two partners in the firm. It was a long day, but a productive one. On Friday, I realized that my prayers had been answered. What was poised to be a week from hell ended up being okay after all. I had one busy day, but no terrible ones. Somehow, all the things that had me hyperventilating, managed to work themselves out without much assistance from me at all. I guess the moral of this very long (probably boring blog post) is that sometimes you just have to let go and trust that things will work out. If you had told me that last Friday (and some people did) I would have bit your head off (and I did to a few people... Opps! Sorry y'all). But now, I see clearly that when I really, really needed it -- life decided not to give me more than I could handle. And friends, that's always a happy ending. Yaay for blogging! Im glad everything worked out and that hill looks super scary!!! I WOULD NEVER LEAVE my house! I'm just glad that you not only got your happy ending BUT that you also got to spend it iced in with Adam #winwin!! Great to hear from you, Kate :) So glad things turned out in your favor. A surprise day off is sometimes just the reset button you need to get a grip on things, huh? Enjoy your weekend! Glad things worked out for the best! 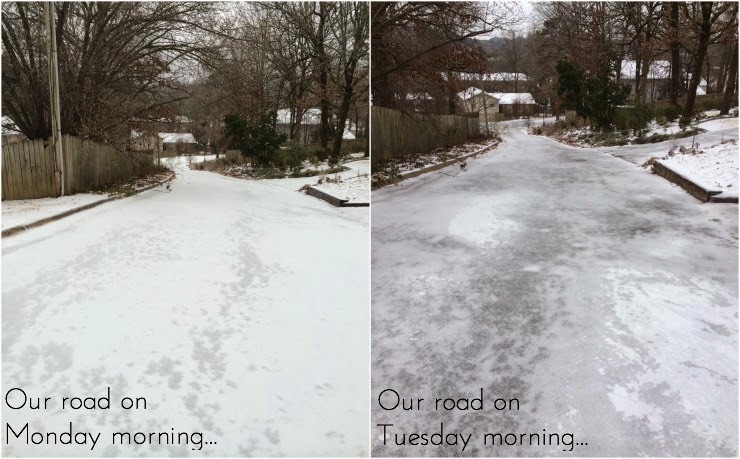 We were lucky we haven't been iced in this year... That ice is scary! I've been having the same kind of weeks lately. They seem overly nuts and end up calming down with prayers answered. Glad it all worked out! The lawyer in me felt so much relief for you. Like I smiled soo much! I kinda have a week like that this week and Im hoping for just a little relief ... just a little. I am so glad everything worked out for you! Yay for happy endings, you were way overdue!